I probably should have posted this a couple of days ago but... Hello April! So far it has been a good month and the rest of it looks set to be rather busy. The school holidays started today which I am so pleased about. I am exhausted and whilst I know I won't exactly be putting my feet up got two weeks I will appreciate the change of routine. Hopefully we'll also get a few lazy mornings. April is also an exciting month because it's my birthday. I was feeling quite bummed about turning 37 but I have realised I have so many friends turning 40 this year without complaining. I really shouldn't be fussed about 37! And I must mention a much more important birthday this month. My little boy will be turning two. Whilst I am a bit sad that this means a definite end to the baby years I am actually more excited because two is such an amazing age. There will be so much fun stuff he and I can get up to together. So let me wish you a happy weekend and a happy Easter holidays if you are off on them too. I will leave you with this lovely photo. I don't think I need to explain why I love it. 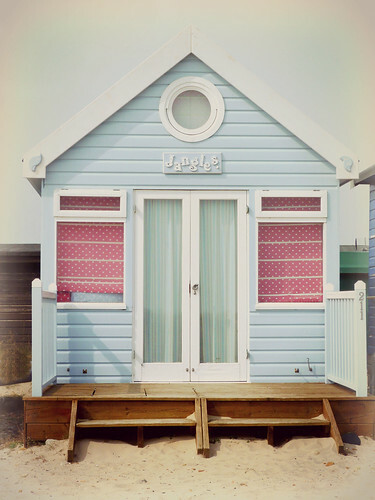 It's a beach hut that is just all kinds of pretty. A perfect photo to kick off what I hope will be a wonderful Easter.